Welcome to this weeks Read With Me. Thank you to all who linked up last week. I love finding out what you have all been reading whether it has been for yourself or for your children, there have been some great recommendations. This month seems to have been a slow month for reading for me. So far I have only managed to read 7 books, this may sound a lot to some of you but I feel like I'm slacking. I just haven't managed to find the time or the peace and quiet to sit down and really enjoy books as much as I would like. Do any of you find you go through spurts like this? This week I'm changing Read With Me a little, instead of writing my review here, I have written my book review in a separate post as I felt this gave me more of chance to describe the story I was reading in more detail. You can find my post linked up already below. 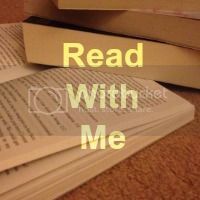 If you are new to Read With Me, please take a look here and find out more about it but to all of you regular visitors come and link up all those lovely book related posts, take the time to comment on a couple of other posts and if you're feeling nice I would love for you to grab my badge too. Happy reading everyone. Lovely linky, thank you for hosting.